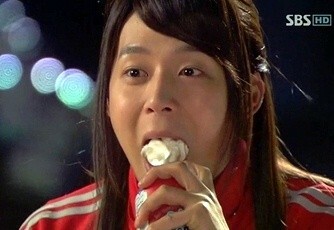 The ‘novel’ snack that goes with wine that debuted in Rooftop Prince exploded in popularity. In the episode of SBS’ Rooftop Prince broadcast on March 22nd, 2012, there was a scene where Park Ha (Han Ji Min) who becomes the dependent of crown prince invites crown prince Lee Gak (Park Yoochun) to soju in order to console him. Park takes out the butter cream spray and soju, and uses the cup of the cream spray as cup to console Lee Gak. Park Ha sprayed a mouthful of sweet butter cream for crown prince who frowned due to sweet and bitter soju. The awkward Lee Gak felt novelty about the butter cream in his mouth that melt instantly, and Park Ha was showing a cute face. After the broadcast of TV series, netizens praised the born of new snack for the wine, the cream beside the soju. They said, “butter cream spray + soju, I also want to eat,” “What is the taste in actual,” “Feel like a little,” “Soju and butter cake seem to be good too,” “Slightly bitter soju and sweet cream? Really wonderful…” and so on, displaying a high degree of concern. In fact, the orders by some netizens on online store surged, causing the butter spray to temporarily out of stock.